Railfuture's latest book Britain's Growing Railway shows how 400 stations have been opened (or reopened) since 1960, along with 600 miles of new track. The book costs £9.95 post free. Click 'Buy Now' in the top right-hand corner of this page. Railfuture's latest book lists Britain's railway stations and lines that have opened or reopened in the past 50 years. 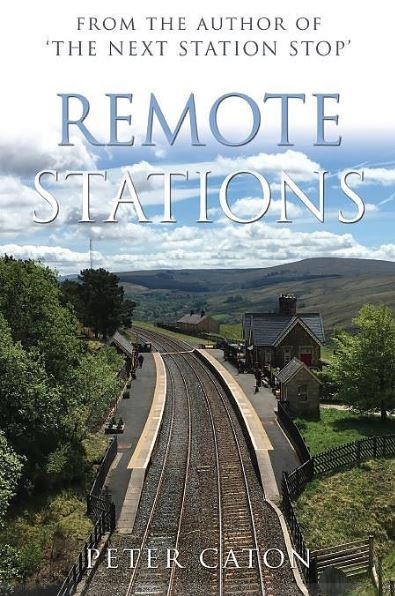 This new edition contains 192 pages updating and expanding on our 2010 edition and giving an in-depth description of the dozens of new stations opened in the past seven years. The A5 perfect-bound book is illustrated with photographs throughout. Published at the same price as the earlier edition, despite 64 extra pages, the book costs £9.95 including postage. Buy while stocks last. Britain's Growing Railway is a vital tool for rail campaigners and shows construction costs, funders, station specifications and facilities provided, with examples of stations and lines where patronage has far exceeded expectations. Click [MORE] for more details. Non-members can subscribe to Railwatch magazine every quarter - click Subscribe to Railwatch. For a full list of items available for purchase online, please click Sales Items. Railfuture is offering its books and some other selected books that document and promote rail schemes that are campaign aims of Railfuture, for which it is paid a small but useful commission (see FLIER). Books that are not produced by Railfuture may be dispatched by an outside organisation. Click SHOP to go to our 'shop' main page, which has links to everything you can buy online from Railfuture - if delivery address is outside the United Kingdom then please contact us on books@railfuture.org.uk before placing an order as a higher price may apply. We are offering the following discounts on third-party-books bought through our web-site (dispatched either by the publisher or the author). Unfortunately we have been unable to obtain a discount on a few of the other books on this page. However, all books purchased here will earn Railfuture a small commission to help fund our campaigning. This drop-down lists on this page are limited to 10 books. If you cannot see a particular book below, please click ALL BOOKS. Please read our full Terms & Conditions before placing your order. 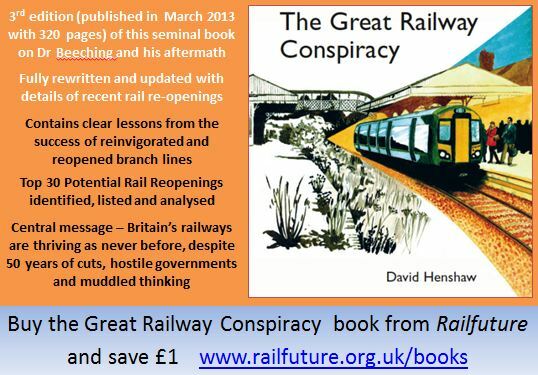 Railfuture is able to offer the book for £9.99 (a 99 pence discount), and every purchase will also support our campaigning. Select the book in the "Buy LATEST book" drop-down list on the right and click 'Buy Now'. 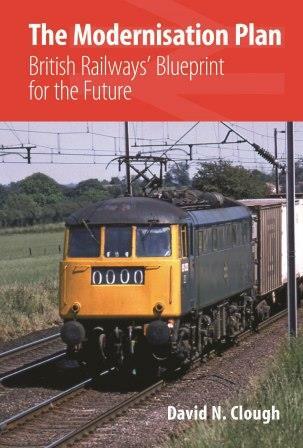 Railfuture is able to offer the book for £8.99 (a £1 discount), and every purchase will also support our campaigning. Select the book in the "Buy OLDER book" drop-down list on the right and click 'Buy Now'. A major new book that considers the social and economic impact of "Beechng" rail closures of the 1960s and beyond and how, in the light of subsequent passenger demand and line re-openings, the original decisions now appear seriously flawed. Those closures left a lot of gaps in Britain's railway network and a legacy of inadequate capacity. The book considers which lines Beeching and his successor should have kept, and what lessons can we learn from the closures today. This book follows the authors' successful 2012 publication entitled Holding the Line, which has been Railfuture's largest selling third-party book. 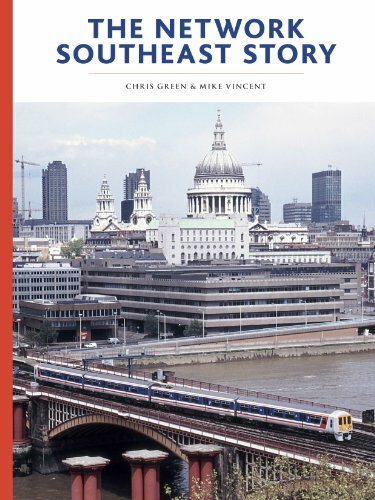 Railfuture is able to offer this hardcover book at just £20, which is £5 off the RRP (£25). In addition the profit on your purchase will contribute to Railfuture's campaigning. [more]. To buy "Disconnected!" select the book in the 'LATEST' drop-down list on the right and click 'Buy Now' below it. An ideal book as a present to someone who is interested in the railway and wants to know more about how Britain's uniquely (and, many would say, excessively) fragmented railway works in an easy-to-read book written by Dan Harvey. 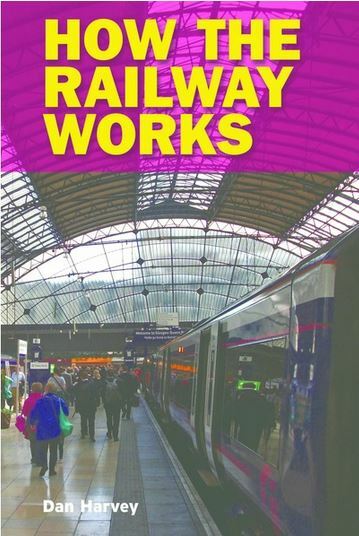 This book covers a wide range of topics such as the franchising system, the role of the different TOCs, passenger and freight, other operators on the network, who owns the railway infrastructure and how that is managed, the role of the government, Network Rail and statutory organisations, regional bodies involved in the railways, the rolling stock leasing companies, how ticketing and timetabling is managed, what happens in the event of an accident, together with details of how the workforce is run and managed. 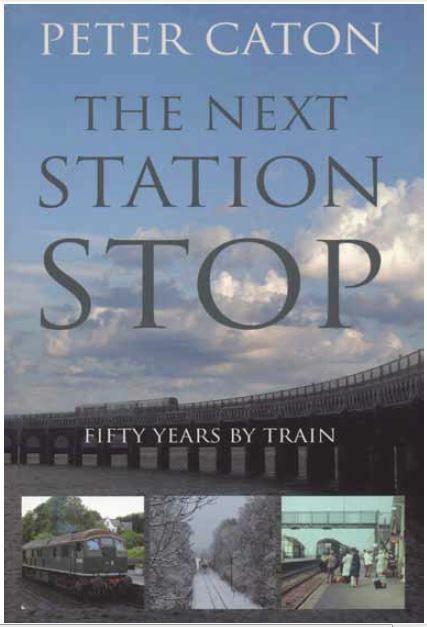 Railfuture is able to offer this hardcover book at just £16, which is £4 off the RRP (£20). In addition the profit on your purchase will contribute to Railfuture's campaigning. [more]. To buy "How the Railway Works" select the book in the 'LATEST' drop-down list on the right and click 'Buy Now' below it. These are three lovely hardback books in the "Story" series and Railfuture is selling all three. 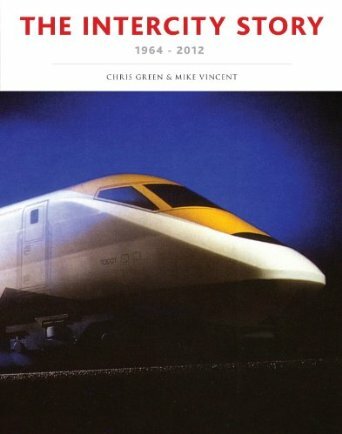 The first two (The Intercity Story, and the Network South East Story) were both co-written by Mike Vincent and the very highly regarded career-railwayman Chris Green, who is one of Railfuture's vice presidents. The third, the Regional Railways Story, is co-written by Gordon Pettitt and Nicholas Comfort. 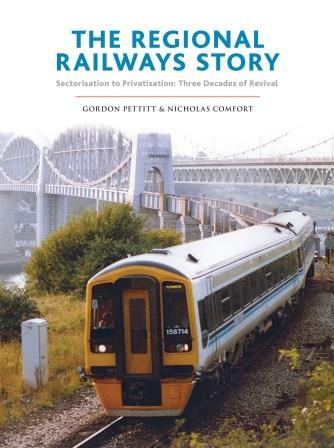 The 256-page Regional Railways Story was published in September 2015, and describes the three decades of revival in the fortunes of regional rail services during sectorisation and the twenty years of privatisation [more]. The 192-page Network South East Story was published in May 2014, and describes the transformation of the rail services London stretching from King's Lynn in the north to Exeter in the west [more]. 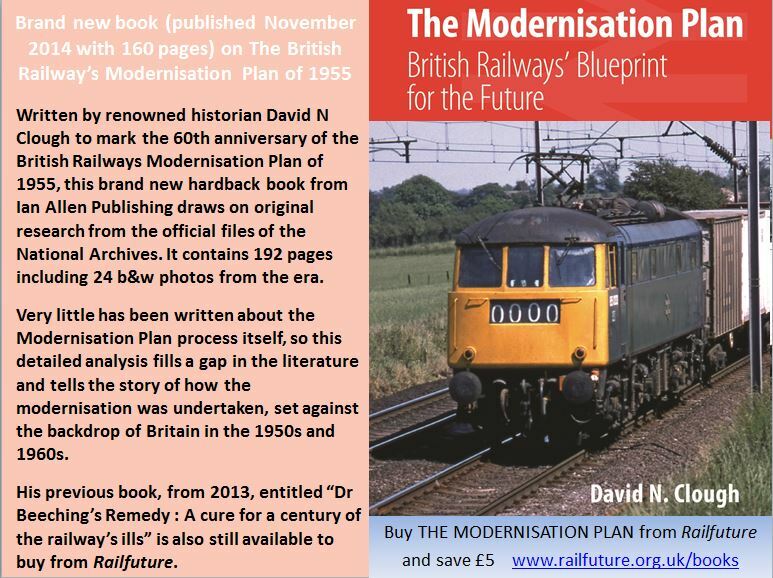 It follows the authors' successful 2013 publication of a revised 256-page hardback covering the fascinating story about Britain's modern InterCity rail service from its creation as part of Dr Reeching's 'reshaped' railway through to the current day [more]. We regret that we are unable to offer this book but it can be obtained elsewhere. Unfortunately all three books are only available in hardback at a rather pricey RRP of £30.00 for RRS and NSE with the InterCity Story costing £35.00. Railfuture is able to offer a discount on the first two - £22.00 (an £8.00 discount). Every purchase will also support our campaigning. For the Regional Railways Story select the book in the 'LATEST' drop-down list on the right and click 'Buy Now' below it. For the other two click on the 'OLDER' drop-down. RRP is £22.50, but Railfuture is able to offer the book for £17.50 (a £5 discount), and every purchase will also support our campaigning. Select the book in the drop-down list on the right and click 'Buy Now'. 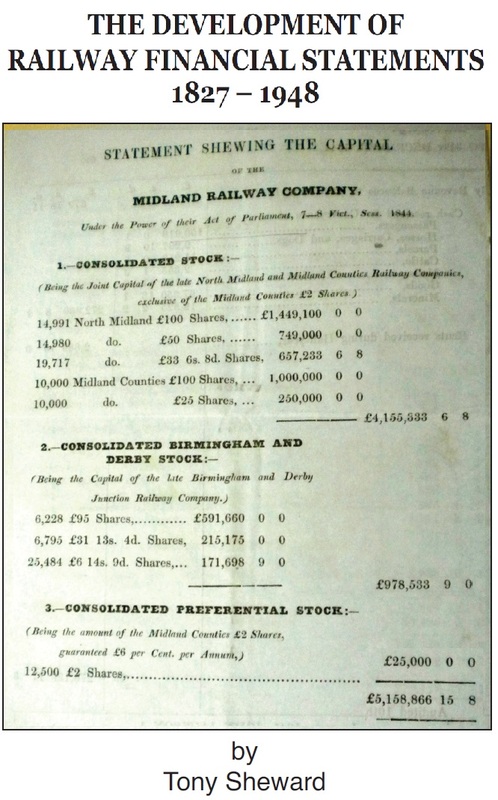 The book analyses the influence of various factors, such as the example of the canals, railway regulation, company law and the railway companies’ individual pattern of development. This is an area of railway research, which has hitherto only been sparsely covered. 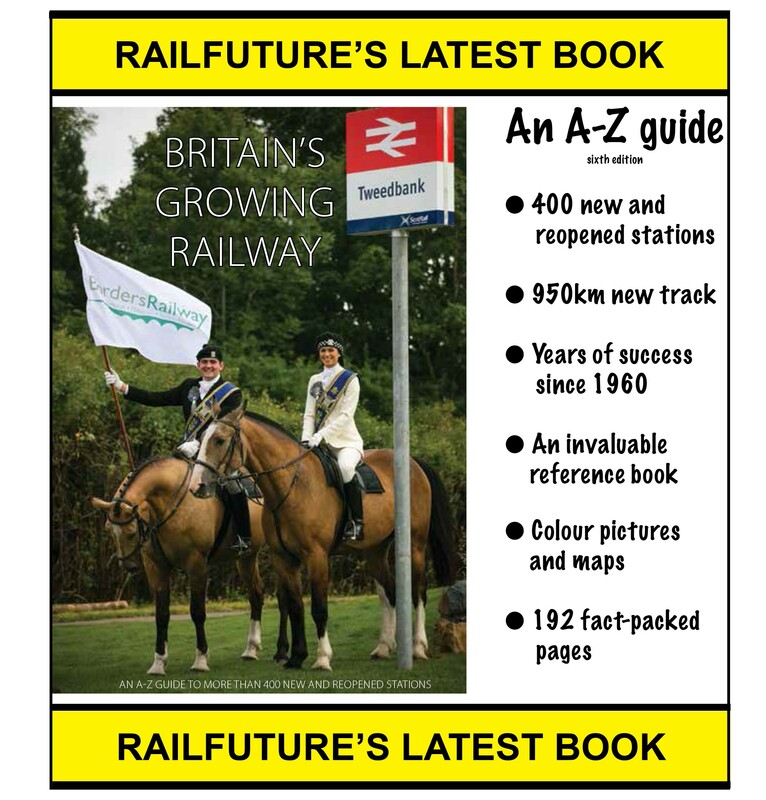 Railfuture is able to offer the book for £18.00 (a £2 discount), and every purchase will also support our campaigning. Select the book in the drop-down list on the right and click 'Buy Now'. Published in March 2013 this seminal book on Dr Beeching and his aftermath has been fully rewritten by its original author, David Henshaw, and includes details of the latest rail re-openings. Was there really a conspiracy? Read how the cuts went on under a Labour Government that had pledged to halt closures. And how dirty tricks were used to make branch lines seem less viable than they really were. 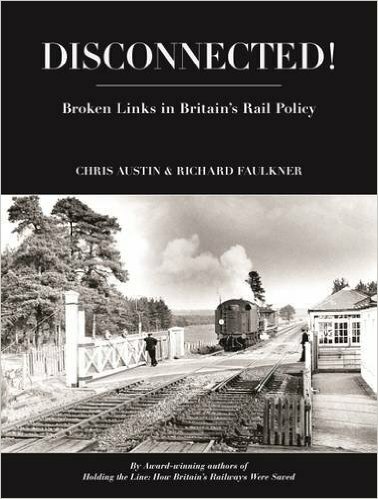 RRP is £14.99, but Railfuture is able to offer the book for £13.99 (a £1 discount), and every purchase will also support our campaigning. Select the book in the drop-down list on the right and click 'Buy Now'. David Spaven was a guest speaker at Railfuture's Rail Reopenings Conference in Stirling in June 2012. He spoke about the fight to prevent the closure of the Waverley Route through the Borders between Edinburgh and Carlisle (yes, that really is David Steel MP on the front cover), the failed attempts to reopen the line as a private venture, and the long campaign that has finally seen approval to completely reconstruct the route (on the original formation) as far as Tweedbank. The construction works are now in progress and an opening date of September 2015 is planned. The Waverley route costs just £14.99 in paperback and £20.00 hardback, both include delivery. The book will be posted by an external agent (the publisher) on Railfuture's behalf. This page is limited to 10 books. If you cannot see a particular book, please click ALL BOOKS. To order, pay securely using your credit/debit card or PayPal account by using the 'BuyNow' facility on the right at the top of the page, or click Sales Items to buy the book and other items not shown on this page at the same time.